Yesterday we received the most exciting little package in the mail from one of our favorite shops, Crunchy Cuts. I'm a big fan of this shop for several reasons, #1 because it's a family owned and run business, #2 it's an Etsy shop, and being a fellow Etsy shop owner I love supporting homemade and handmade and #3, all the items are super sturdy and excellent quality. Erica lives in Colorado Springs with her family and runs Crunchy Cuts, a shop that carries clothing for mamas and their littles. She also does custom work, so if you don't see anything that catches your eye I'm sure she would be happy to work with you to design just what you are looking for. The first shirt in these photos is actually for Valentine's Day (but really it's perfect for any day of the week/month/year ;)) and the happy news is that Erica is offering free shipping on any Valentine's Day items! 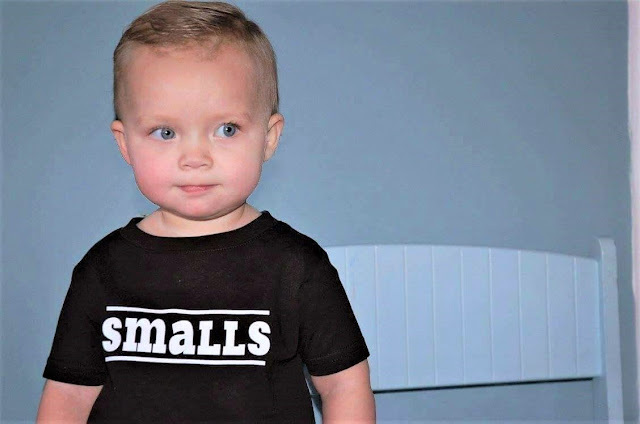 The second is an adorable little "smalls" shirt. Just the things for my small little Baba Goo. Also, Erica gave me a coupon to share with you. Just use the code ROCKIT to get 15% off your order! What we do most days; read books and hang with Curious George. Look at all those baby curls. Some days they are cute and curly, some days they are wild and flying everywhere, and then other days they just plain look like a mullet. I'm telling you, I can't win. My little one looks like a boy here. Sigh. A cute boy, but still, a boy. Oh, and we also play with balls all day long too. They are still Adri's favorite toys.